We create meaningful jewellery that celebrates the fragile beauty of our flora and fauna, all of which contain rare Welsh gold - the gold of royalty for over 100 years. The Tree of Life®Anchor stud earrings evokes the story of hope and strength with the symbolic anchor, combined with the evergreen bonds of love, family and friendship from the intricate details of the Tree of Life® vine. A beautiful set crafted from sterling silver and 9ct rose gold created in support of Hope House Children’s Hospice. 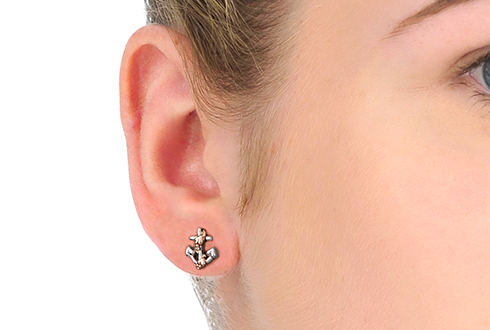 Order your Hope House Anchor Stud Earrings before 4pm on a working day and we'll despatch your Hope House Anchor Stud Earrings the same day (stock permitting). During very busy periods (i.e., near Christmas and Valentine's Day) your order may be despatched the next working day. Guaranteed by Royal Mail to reach you the next working day (excluding bank holidays) if you order your Hope House Anchor Stud Earrings before 4pm and your Hope House Anchor Stud Earrings are in stock. For hygiene reasons, earrings cannot be returned unless you have received them in a faulty condition. See our full returns policy for more details. Your Clogau Hope House Anchor Stud Earrings are protected against all manufacturing faults for 2 years with our free extended warranty cover. 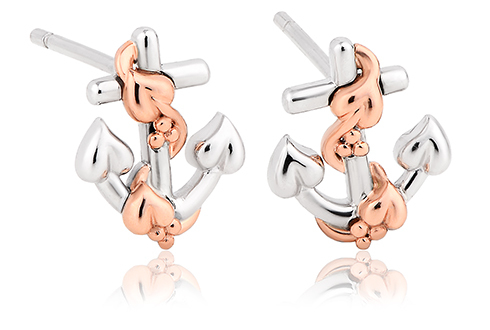 Register your Hope House Anchor Stud Earrings for extended warranty online. Place an order for £59 or more online and you'll receive a free £10 online voucher which you can use on any order of £99 or more on our website within 2 months. All orders of £250 or more to the UK are despatched via Royal Mail next working-day delivery to guarantee delivery the next working day (excluding weekends). All orders of £249.99 or below to the UK are sent via Royal Mail Recorded Signed For™, which means you'll receive your order within 3 - 11 days (excluding Sundays). Upgrading to next working-day delivery: If your order value is £249.99 or below, you can choose to upgrade your order from standard delivery to next working-day delivery for £7.00 by adding the postage upgrade to your shopping bag. All deliveries require a signature. If nobody is at the delivery address, the delivery driver will leave a card with a telephone number on for you to make alternative arrangements. Orders are fully insured by us whilst in transit with Royal Mail. All orders at www.clogau.co.uk with UK addresses are delivered free, no matter how large or small. Telephone orders on 0345 606 88 77 of £149.99 or less to UK delivery addresses are charged £7. Telephone orders on 0345 606 88 77 of £150 or more to UK delivery addresses are FREE. All orders placed on www.clogau.co.uk to non-UK address are charged £30. We offer all of our direct customers (excluding retailers) a 14-day “no quibble” money-back returns policy, except on earrings (for hygiene reasons), soldered items, engraved items and perfume that has been opened. Returns may be subject to postage charge, depending on circumstance. Please see our full Returns Policy for full details. Can I return my item? We give you a 14 day “no quibble” money-back guarantee on all items except earrings, soldered items, engraved items and opened fragrances. So if you're unsatisfied with your Clogau jewellery or watch for any reason, you can return it unworn and in its original packaging, and within our return dates, for a full refund or exchange. Organise a return online or call us on 0345 606 88 77. Read more about our returns policy. How do I look after Clogau jewellery? • Ensure that it doesn’t come into contact with household solutions such as hair spray, perfumes, cleaning products, bleach, etc. • Periodically polish it with a soft jewellery polishing cloth with tarnish preventative to help keep your gold and silver pieces lustrous and shining. How will my item arrive in the post? Every order we send will arrive in an anonymous package, without any Clogau branding. So don’t worry if you're buying a gift for someone, we won’t spoil the surprise. Orders of £249.99 or less are sent by Royal Mail Recorded Signed For™ (these usually arrive within a few days but can take up to 12 days on rare occasions, excluding Sundays). You can upgrade your postage to next working-day delivery for £7.00. All orders of £250 or more to the UK are despatched via Royal Mail next working-day delivery to guarantee delivery the next working day (excluding weekends) if you place your order before 4pm and all of your items are in stock. All deliveries require a signature on delivery. During very busy periods (such as Christmas) your order may be despatched the next working day. How much is international delivery? Orders delivered to non-UK addresses cost £30 and are posted by FedEx International. A signature is required on delivery. Can you deliver my order to a different address? Yes, even if it is your first order with us. Yes, but you must have an online account with us (which is free of course). Simply click the ‘Order Tracking/History’ link once you have signed in to your account. Can I have my item gift wrapped? A gift box adds the perfect finishing touch, and creates that all-important first impression – and our Clogau gift boxes do just that with a combination of black card, black tissue paper, a golden bow and a message card for just £5.50. Your gift can be delivered either to you or direct to the recipient with a card containing a message from you. You can choose to have it delivered flat-packed or fully wrapped. Gift boxes come in two sizes. Large items such as bangles, bracelets, necklaces, and watches are gift-boxed in the larger box. 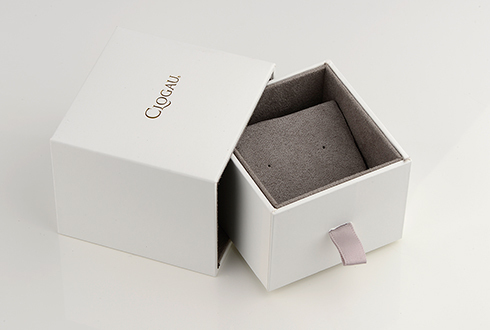 Small items such as earrings, pendants, rings, cufflinks, charms and brooches are gift-boxed in the smaller box. Is Welsh gold included in my jewellery? Yes. Every piece of Clogau jewellery contains rare Welsh gold. To certify this, our jewellery is stamped with a unique Welsh Dragon mark and a Clogau logo. Does this item come with a warranty? All jewellery items and watches come with one year manufacturer's warranty as standard. However, you can also register online for extended 2 year warranty cover within 30 days of purchase. Our extended warranty scheme covers your Clogau jewellery or watch against all manufacturing faults for two years, no matter where you purchased it from, when you register your item/s with us. Watches normally have an ATM classification which relates to their degree of water resistance. ATM is a measure of atmospheric pressure at sea level. 3ATM means the watch can withstand 3 times the atmospheric pressure at sea level and 5ATM to 5 times the atmospheric pressure at sea level. This can sometimes cause confusion as some people interpret this as how far the watch can be taken underwater before it is compromised. This is incorrect. As rain water splashes against your watch it hits it with a degree pressure. This is what the ATM measurement relates to; the pressure of splashes against your watch. These make them suitable for everyday use and resistant to modest water/rain splashes. They are not suitable for swimming, showering, bathing, diving or water sports so you will need to remove your Clogau watch before taking part in these activities. It’s also important to remove your watch before entering a steam room or a sauna. Extreme heat can cause damage to the watch seals and condensation can form inside the watch. Please note: any water damage to your watch is not covered under warranty. Can I have the chain extended? You can extend your pendant or necklace by up to 4 inches with our selection of extension chains in different gold and silver types. What do I get with my order? • Clogau booklet explaining all aspects of our jewellery – where our Welsh gold comes from, our heritage, how to care for your jewellery, our diamonds and gemstones, our 2 year warranty scheme, and much more. How do I pay for my order? Mastercard, VisaDebit, Switch, Maestro, Delta, Visa, Visa Electron and PayPal. Or you can pay over the phone by calling us on 0345 606 88 77 (charges from landlines and mobiles may vary. Please refer to your service provider for all charges). Where can I find more details about this item? The full specifications of this item are to be found further up this page in a section labelled "Specifications". Can I speak to someone about my order? How do I find out my ring size? You can find your ring size by using our online ring sizer. Can I engrave my item? At present we can engrave onto a select number of Clogau items. We indicate when an item is engravable by putting the word "Engravable" in the description box above. Check which items can be engraved. Can I have a copy of your latest brochure? Of course you can. Just fill-in your details on our brochure request page and we'll send a copy to your door as soon as possible. If you're already on our mailing list, we'll send you a copy automatically so you don't need to request a copy. Can I use my Clogau voucher? Yes. We'll ask for it during your online order when it's time to pay. Do you have an ethical sourcing policy? Yes. Clogau is a company that prides itself on creating jewellery that is not only beautiful, but also expertly handcrafted to a consistently high quality using ethically mined gold and conflict-free diamonds. If you want to know more, we have an ethical policy guide on our corporate website which includes information on where our Welsh gold is sourced from and how it was mined, our manufacturing techniques, our conflict-free diamonds, our 7 stage quality control process, our policies, our memberships to several highly esteemed associations that guarantee the quality of our jewellery and also the support we give to several charities including Marie Curie Cancer Care and Hope House Children's Hospices. © Copyright 1998-2019. Clogau Gold of Wales Ltd. All rights reserved. Credit subject to status and affordability. Terms and Conditions apply. Clogau Gold of Wales Limited are a credit broker and are Authorised and Regulated by the Financial Conduct Authority. Credit is provided by Hitachi Personal Finance, a division of Hitachi Capital(UK) PLC Authorised and Regulated by the Financial Conduct Authority. https://www.clogau.co.uk/jewellery/item/hope-house-anchor-stud-earrings-3sactle 3SACTLE Hope House Anchor Stud Earrings https://www.clogau.co.uk/i/3SACTLE/3SACTLE.jpg 129 GBP InStock Earrings Hope House Anchor The Tree of Life®Anchor stud earrings evokes the story of hope and strength with the symbolic anchor, combined with the evergreen bonds of love, family and friendship from the intricate details of the Tree of Life® vine.